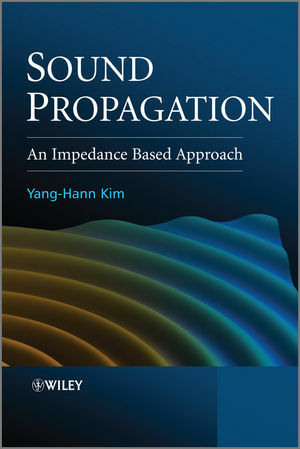 In Sound Propagation: An Impedance Based Approach, Professor Yang-Hann Kim introduces acoustics and sound fields by using the concept of impedance. Kim starts with vibrations and waves, demonstrating how vibration can be envisaged as a kind of wave, mathematically and physically. One-dimensional waves are used to convey the fundamental concepts. Readers can then understand wave propagation in terms of characteristic and driving point impedance. The essential measures for acoustic waves, such as dB scale, octave scale, acoustic pressure, energy, and intensity, are explained. These measures are all realized by one-dimensional examples, which provide mathematically simplest but clear enough physical insights. Kim then moves on to explaining waves on a flat surface of discontinuity, demonstrating how propagation characteristics of waves change in space when there is a distributed impedance mismatch. Next is a chapter on radiation, scattering, and diffraction, where Kim shows how these topics can be explained in a unified way, by seeing the changes of waves due to spatially distributed impedance. Lastly, Kim covers sound in closed space, which is considered to be a space that is surrounded by spatially distributed impedance, and introduces two spaces: acoustically large and small space. The bulk of the book is concerned with introducing core fundamental concepts, but the appendices are included as the essentials as well to cover other important topics to extend learning. Sound Propagation is geared towards graduate students and advanced undergraduates in acoustics, audio engineering, and noise control engineering. Practicing engineers and researchers in audio engineering and noise control, or students in engineering and physics disciplines, who want to gain an understanding of sound and vibration concepts, will also find the book to be a helpful resource. Yang-Hann Kim is a Professor of Mechanical Engineering at Korea Advanced Institute of Science and Engineering (KAIST), where he is also Director of the Center for Noise and Vibration Control (NOVIC). He has been teaching acoustics at undergraduate and graduate levels for more than 20 years. Kim's research interests include sound visualization, active noise/vibration control, sound focusing, structural acoustics and duct acoustics. He has won numerous awards, including the Excellence Award in Technology Teaching from Ministry of Industrial Development, Second Place Award at the Gallery of Acoustics during the 132nd meeting of the ASA, and other awards at KAIST and from Korean acoustical societies. He is an active with various journals and societies, having served on the editorial board of the Journal of Sound and Vibration for 11 years and continuing to serve on the Editorial Board as the Handling editor of the Journal of Mechanical Systems and Signal Processing. Kim holds a B.S in Naval Architecture and Marine Engineering from Seoul National University and a PhD in Mechanical Engineering from MIT. 1.2 From String Vibration to Wave. 1.4 Specific Impedance (Reflection and Transmission). 1.5 The Governing Equation of a String. 1.6 Forced Response of a String: Driving Point Impedance. 1.7 Wave Energy Propagation along a String. 1.9 Essentials of Vibration and Waves. 1.9.1 Single- and Two-degree of Freedom Vibration Systems. 1.9.2 Fourier Series and Fourier Integral. 1.9.3 Wave Phenomena of Bar, Beam, Membrane, and Plate. 2 Acoustic Wave Equation and Its Basic Physical Measures. 2.2 One-dimensional Acoustic Wave Equation. 2.3 Acoustic Intensity and Energy. 2.4 The Units of Sound. 2.5 Analysis Methods of Linear Acoustic Wave Equation. 2.6 Solutions of the Wave Equation. 2.8 Essentials of Wave Equations and Basic Physical Measures. 2.8.1 Three-dimensional Acoustic Wave Equation. 3 Waves on a Flat Surface of Discontinuity. 3.2 Normal Incidence on a Flat Surface of Discontinuity. 3.3 The Mass Law (Reflection and Transmission due to a Limp Wall). 3.4 Transmission Loss at a Partition. 3.5 Oblique Incidence (Snell’s Law). 3.6 Transmission and Reflection of an Infinite Plate. 3.7 The Reflection and Transmission of a Finite Structure. 3.9 Essentials of Sound Waves on a Flat Surface of Discontinuity. 3.9.2 Transmission Loss by a Partition. 3.9.3 Transmission and Reflection in Layers. 3.9.4 Snell's Law When the Incidence Angle is Larger than the Critical Angle. 3.9.5 Transmission Coefficient of a Finite Plate. 4 Radiation, Scattering, and Diffraction. 4.2 Radiation of a Breathing Sphere and a Trembling Sphere. 4.3 Radiation from a Baffled Piston. 4.4 Radiation from a Finite Vibrating Plate. 4.7 Essentials of Radiation, Scattering, and Diffraction. 4.7.1 Definitions of Physical Quantities Representing Directivity. 4.7.2 The Radiated Sound Field from an Infinitely Baffled Circular Piston. 4.7.3 Sound Field at an Arbitrary Position Radiated by an Infinitely Baffled Circular Piston. 4.7.4 Understanding Radiation, Scattering, and Diffraction Using the Kirchhoff–Helmholtz Integral Equation. 4.7.5 Scattered Sound Field Using the Rayleigh Integral Equation. 4.7.6 Theoretical Approach to Diffraction Phenomenon. 5 Acoustics in a Closed Space. 5.2 Acoustic Characteristics of a Closed Space. 5.3 Theory for Acoustically Large Space (Sabine's theory). 5.4 Direct and Reverberant Field. 5.5 Analysis Methods for a Closed Space. 5.6 Characteristics of Sound in a Small Space. 5.9 Essentials of Acoustics in a Closed Space. 5.9.1 Methods for Measuring Absorption Coefficient. 5.9.2 Various Reverberation Time Prediction Formulae. 5.9.3 Sound Pressure Distribution in Closed 3D Space Using Mode Function. 5.9.4 Analytic Solution of 1D Cavity Interior Field with Any Boundary Condition. 5.9.5 Helmholtz Resonator Array Panels. Sound Propagation Visit the companion website to access Matlab codes and PPT slides for instructors to use.